The LeishVet group has formed recommendations designed primarily to help the veterinary clinician in the management of canine leishmaniosis. The complexity of this zoonotic infection and the wide range of its clinical manifestations, from inapparent infection to severe disease, make the management of canine leishmaniosis challenging. The recommendations were constructed by combining a comprehensive review of evidence-based studies, extensive clinical experience and critical consensus opinion discussions. The guidelines presented here in a short version with graphical topic displays suggest standardized and rational approaches to the diagnosis, treatment, follow-up, control and prevention of canine leishmaniosis. A staging system that divides the disease into four stages is aimed at assisting the clinician in determining the appropriate therapy, forecasting prognosis, and implementing follow-up steps required for the management of the leishmaniosis patient. Canine leishmaniosis (CanL) due to Leishmania infantum is a major global zoonosis potentially fatal to humans and dogs, which comprise the main reservoir of infection to humans . CanL is endemic in more than 70 countries in the world. It is present in regions of southern Europe, Africa, Asia, South and Central America  and has been reported also in the United States of America (USA) . It is also an important concern in non-endemic countries where imported sick or infected dogs constitute a veterinary and public health problem . CanL is manifested by a broad spectrum of clinical signs and degrees of severity, and there is insufficient scientific agreement on the management of this disease . LeishVet is a group of veterinary scientists from academic institutes in Europe and the Mediterranean basin with a main clinical and scientific interest in CanL. 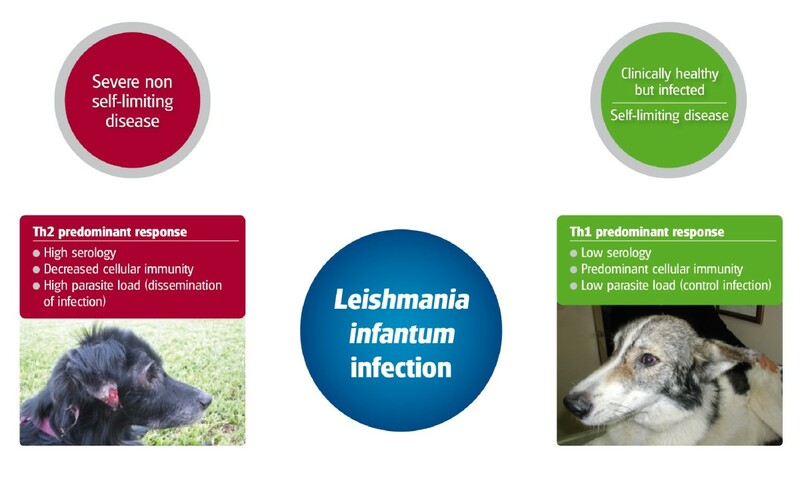 The main goal of LeishVet is to develop consensus recommendations that would represent the most current understanding of L. infantum infection in dogs based on recent evidence-based literature and clinical experience . The objective of these guidelines is to help practitioners in the clinical management of CanL with emphasis on diagnosis, clinical staging, treatment, clinical monitoring, prognosis and prevention. Leishmania completes its life cycle in two hosts, a phlebotomine sand fly vector, which transmits the flagellated infective promastigote form, and a mammal, where the intracellular amastigote form develops and replicates (Figure 1). Sand flies are the only arthropods that are adapted for biological transmission of Leishmania. The relatively low proportion of sand flies harbouring L. infantum (0.5 - 3%) is sufficient for maintaining the infection in endemic areas. Non-sand fly modes of transmission have also been described but their role in the natural history and epidemiology of leishmaniosis remains unclear (Figure 1). Proven modes of non-sand fly transmission include infection through transfused blood products  from blood donors which are carriers of infection [6, 7], vertical [8–10] and venereal transmission . The adequate selection of canine blood donors is of great importance for the prevention of L. infantum infection and recommendations on donor selection are graphically summarized in Figure 2. Suspected yet unproven modes of transmission include: 1) direct dog-to-dog transmission through bites or wounds, which could explain the presence of autochthonous CanL clinical cases  in non-endemic areas in the absence of apparent vectors, as described in foxhounds in the USA  or in breeding kennels in Europe , and 2) transmission by other hematophagous arthropods such as ticks and fleas [15–21] (Figure 1). 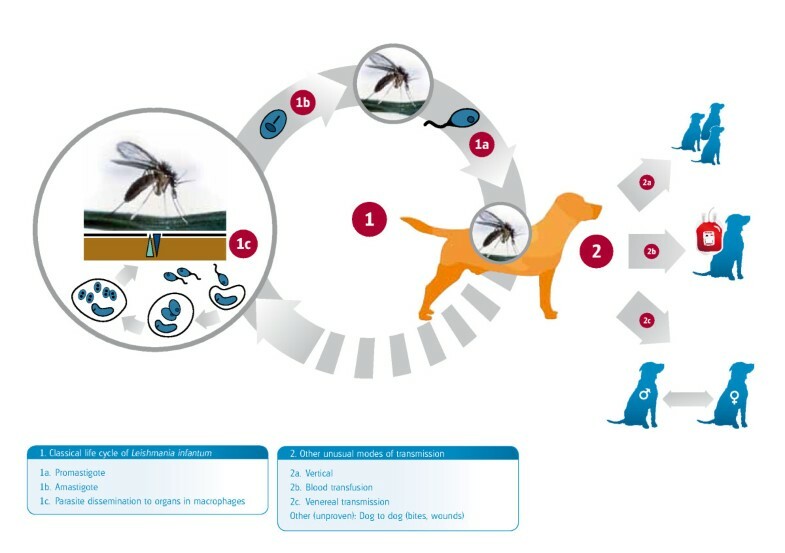 The life cycle of L. infantum with indication of proven and unproven non-sandfly routes of transmission to dogs. 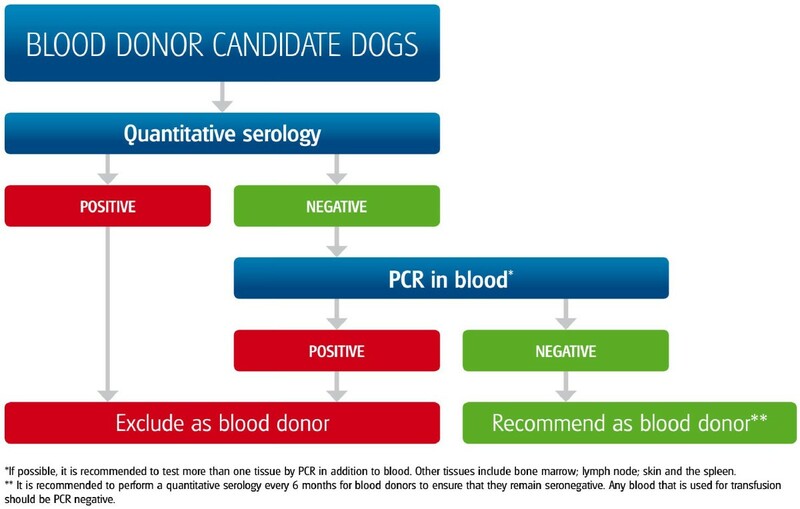 Algorithm describing the selection of blood donors and exclusion of infected dogs. Any dog infected will be excluded. Socioeconomic and possible climate factors have led to changes in the distribution of CanL in Europe (Figure 3). Leishmania infantum infection has spread northward reaching the foothills of the Alps in northern Italy  and of the Pyrenees in France  and northern Spain . 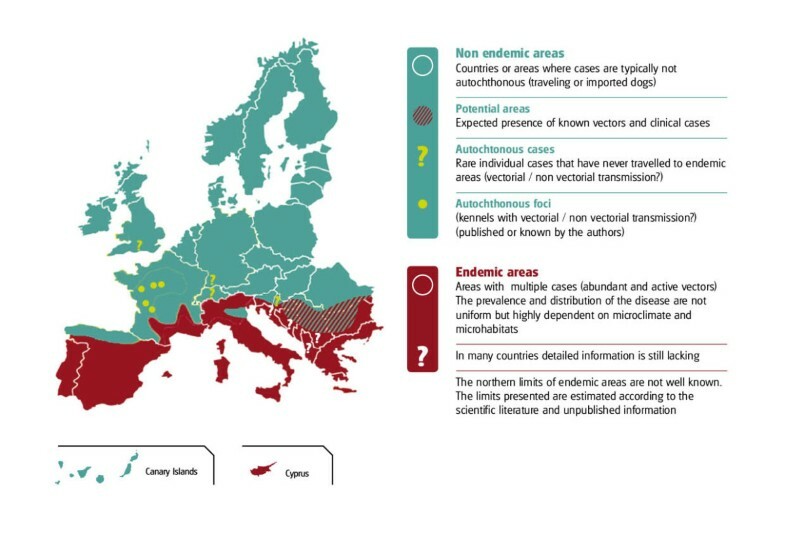 The large numbers of dogs travelling to southern Europe or imported as companion animals from areas where CanL is endemic have increased the number of clinical cases reported in non endemic countries such as the United Kingdom  and Germany . The distribution of canine L. infantum infection in Europe. Leishmania infantum frequently follows an insidious and chronic pattern of infection . Therefore, CanL is a disease in which infection does not equal clinical illness resulting in a high prevalence of subclinical infection [2, 26]. A broad range of immune responses and clinical manifestations have been described in CanL (Figure 4). Infection in dogs may be subclinical or manifested as a self-limiting disease, or a severe, and sometimes, fatal illness . Subclinical infection is not necessarily permanent and factors such as immunosuppression or concomitant diseases could break the equilibrium and lead to the progression of clinical disease in dogs [2, 27] as observed in humans coinfected with human immunodeficiency virus and Leishmania. Clinical manifestations and immunological characteristics of L. infantum infection in dogs. Several predisposing factors for the development of disease have been described including breed, age and genetic background. Some dog breeds such as the Boxer, Cocker Spaniel, Rottweiler and German Shepherd seem to be more susceptible to the development of disease [29, 30], while others such as the Ibizian Hound rarely develop clinical signs of CanL . The Slc11c1 (Solute carrier family 11 member a1) gene, formerly named N-RAMPI, and certain alleles of the MHC II genes have been associated with susceptibility to CanL [32, 33]. Age seems to be an important factor. The distribution of the disease is bimodal, with the highest prevalence reported in dogs younger than 3 years and older than 8 years [34, 35]. CanL is a systemic disease that may potentially involve any organ, tissue or body fluid and is manifested by nonspecific clinical signs. The most common clinical manifestations and clinicopathological abnormalities found in CanL are listed in Table 1[2, 36, 37]. Skin lesions are the most frequent manifestation among them (Figure 5) and may be seen along with other clinical signs or clinicopathological abnormalities. 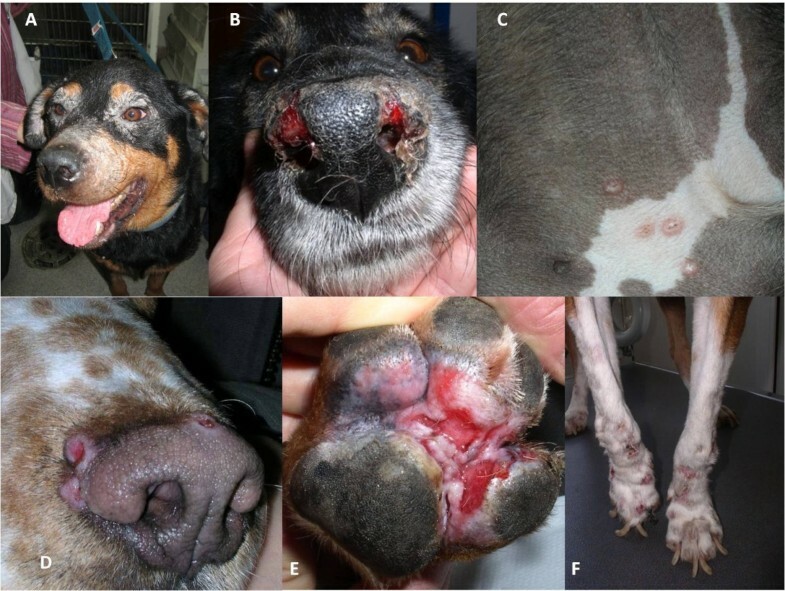 However, dogs can be presented with other clinical signs unrelated to cutaneous lesions as the main presenting complaint [36, 37] (Figure 6). Renal disease may be the sole clinical manifestation of CanL and it can progress from mild proteinuria to the nephrotic syndrome or to an end stage renal disease. Chronic renal failure is a severe result of disease progression and the main cause of mortality due to CanL. 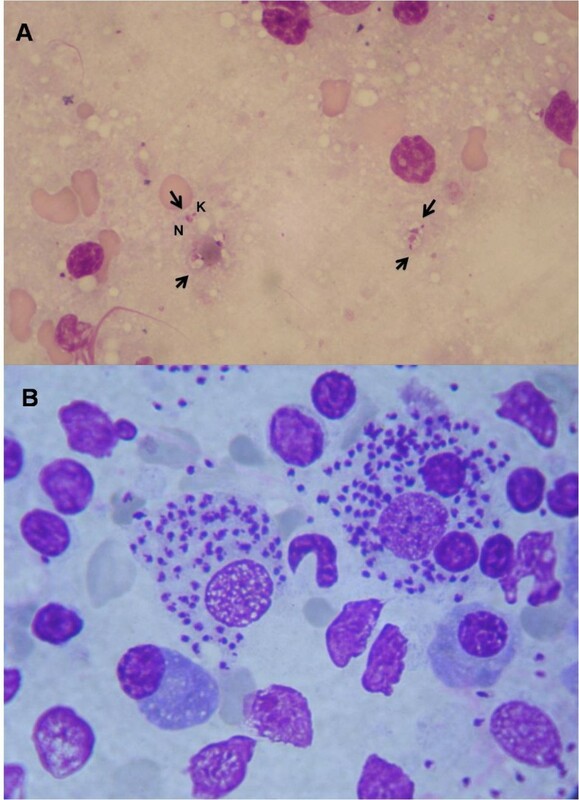 Despite the high prevalence of renal pathology in infected dogs [38, 39], renal azotemia is relatively an uncommon laboratory finding. The common pathological findings detected by cytology (Figure 7) or histology in CanL [40–43] are listed in Table 2. However, the variable and nonspecific clinical signs make the list of differential diagnoses wide and extensive. Cytological and histopathological patterns suggestive of canine L. infantum infection found in organs or body fluids. Different patterns of cutaneous lesions in CanL: A) Exfoliative periocular alopecia and blepharitis; B) Ulcerative nasal mucocutaneous lesions; C) Papular dermatitis in the inguinal region; D) Nodular crateriform lesions bordering the muzzle; E) Ulcerative erythematous lesions on the plantar surface of the paw and between pads; F) Onychogryphosis. Some clinical signs found in CanL: A) Epistaxis; B) Bilateral uveitis and corneal opacity; C) Purulent conjunctivitis and blepharitis; D) Exfoliative alopecia in the rear leg and popliteal lymphadenomegaly; E) Marked cachexia and generalized exfoliative alopecia. 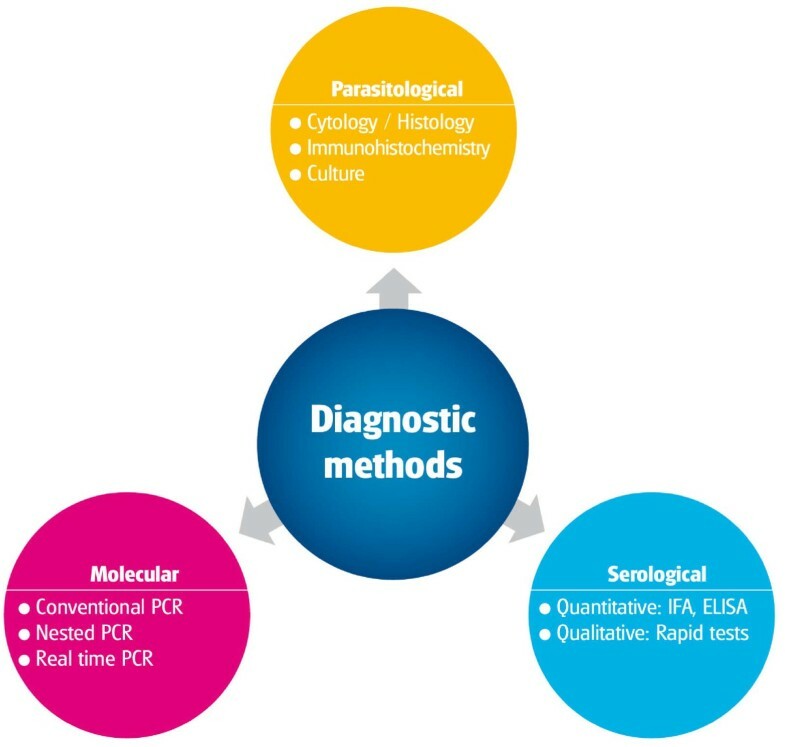 Interpretation of cytology A) Interpretation of cytology requires time and expertise for the detection of Leishmania amastigotes when parasites are in low numbers and freed from the cells. Note the nucleus (N) and the kinetoplast (K) of extracellular amastigotes (arrows) in a fine needle aspirate of a reactive lymph node from a dog with clinical leishmaniosis (x100, Diff-quick stain); B) High numbers of intracellular and extracellular Leishmania amastigotes in a fine needle aspirate of a reactive lymph node from a dog with clinical leishmaniosis (x100, modified Giemsa stain). The purposes for which diagnosis of L. infantum infection is carried out are outlined in Figure 8. Due to these different diagnostic indications, it is important to separate Leishmania infection from disease and to apply different diagnostic techniques for each state. 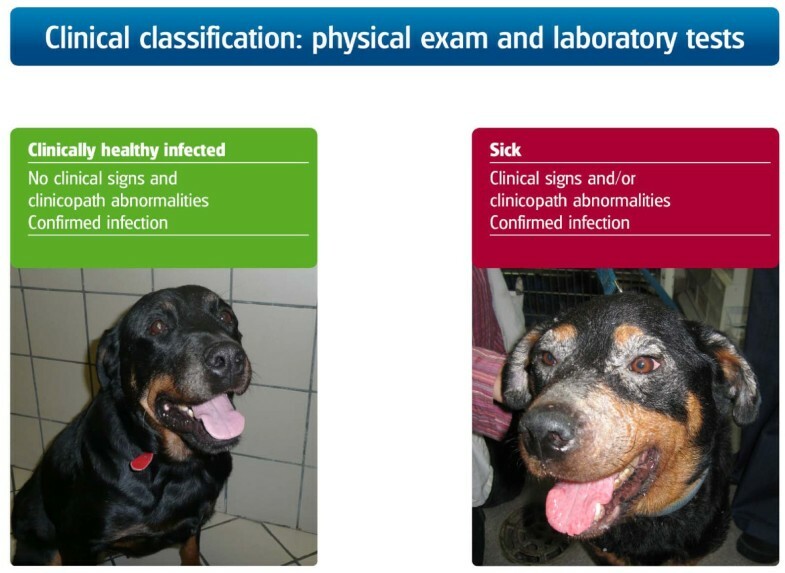 The definitions of sick versus clinically healthy infected dogs are shown in Figure 9 . The different purposes of CanL diagnosis. Definition of L. infantum -infected but healthy versus sick dogs. Dogs with clinical leishmaniosis are defined as those presenting clinical signs and/or clinicopathological abnormalities and having a confirmed L. infantum infection. Dogs with subclinical infection, or clinically healthy but infected dogs, are defined as those that present neither clinical signs on physical examination nor clinicopathological abnormalities by routine laboratory tests (CBC, biochemical profile and urinalysis) but have a confirmed L. infantum infection. The diagnosis of CanL is complex as the clinical spectrum is broad and the range of clinicopathological abnormalities based on at least a complete blood count (CBC), biochemical profile and urinalysis can be both wide and non-specific. A thorough clinicopathological diagnostic approach needs to be adapted for each patient when assessing the suspicion of this disease. 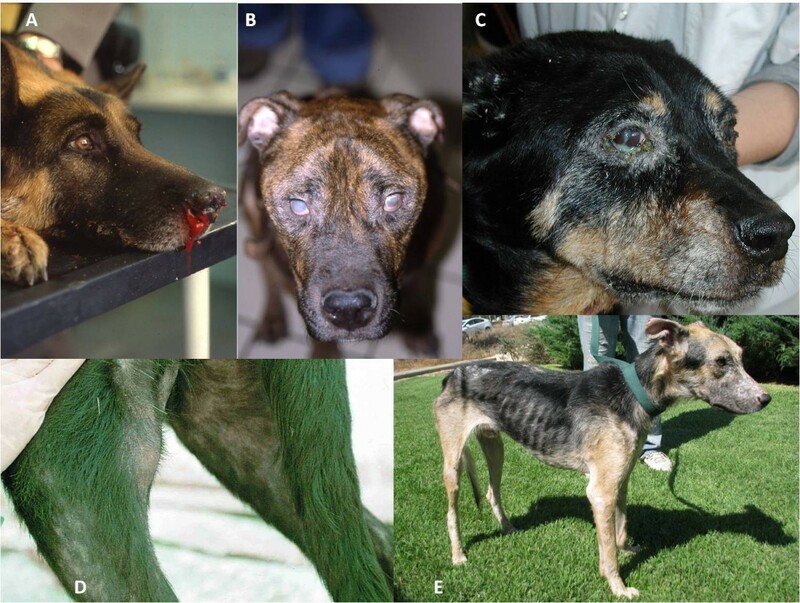 In addition, dogs with leishmaniosis might be co-infected with other vector borne diseases or suffering from other concomitant infectious or non-infectious diseases making the differential diagnoses more complicated and diverse. Therefore, based on the clinicopathological problem list, a differential diagnosis and specific diagnostic approach would be made for each patient. Different specific diagnostic methods have been described for the detection of L. infantum infection in dogs and these are shown in Figure 10. Valid diagnostic tests are essential for the detection of Leishmania infection in sick dogs although they lack 100% sensitivity and specificity . The advantages and disadvantages of the different diagnostic methods are summarized in Table 3. The most common diagnostic methods for CanL. Advantages and disadvantages of common diagnostic methods for the detection of L. infantum infection in dogs. The diagnosis of CanL can be made by the detection of specific serum antibodies (IgG) using preferably quantitative serological techniques, such as the immunofluorescence antibody test (IFAT) and enzyme-linked immunosorbent assay (ELISA). Immunochromatography-based assays are easy to use and provide rapid qualitative results on the spot, but their performance is still not optimal [44–46]. The interpretation of serological qualitative rapid tests is described in Figure 11. It is important to submit samples to a laboratory that runs quantitative serological assays and can provide an endpoint titer (IFAT) or an optical density reading (ELISA) and a classification of the level of antibodies . Interpretation of serological qualitative rapid tests for CanL. Detection of Leishmania DNA in tissues by PCR allows sensitive and specific diagnosis of infection. PCR can be performed on DNA extracted from tissues, blood, body fluids or even from histopathologic specimens. 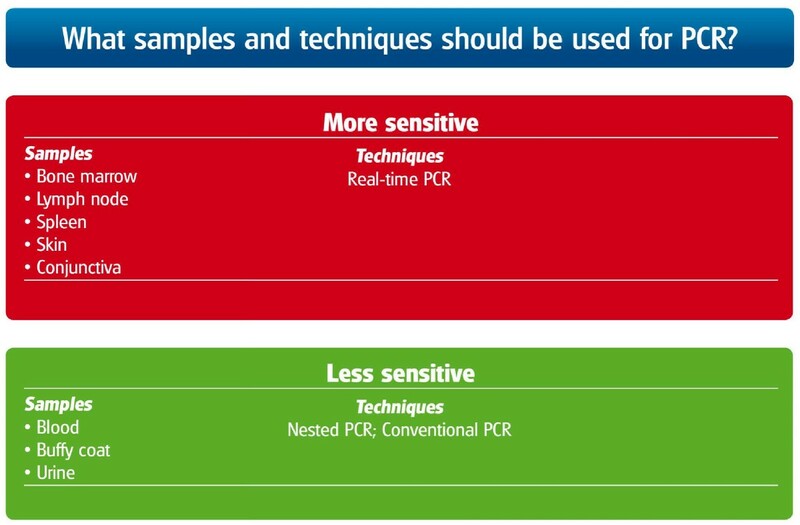 The different sensitivities of tissues for the detection of L. infantum by PCR [27, 47, 48] and variable sensitivities of PCR techniques are listed in Figure 12. Assays based on the detection of kinetoplast DNA (kDNA) appear to be the most sensitive for direct detection in infected tissues [49, 50]. Real-time PCR allows quantification of the Leishmania parasite load in the tissues of infected dogs, which is useful for the diagnosis and the follow-up during treatment [51, 52]. It is important to highlight that information provided by PCR should not be separated from the data obtained from clinicopathological and serological evaluations. Selection of tissues to be used for PCR and types of PCR techniques when suspecting CanL. A high level of antibodies confirms the diagnosis of CanL in a dog with clinical signs and/or clinicopathological abnormalities compatible with leishmaniosis . However, the presence of a low antibody level is not necessarily indicative of the disease and further work-up is necessary to confirm or exclude clinical leishmaniosis . The diagnostic approach for sick dogs living in an endemic area is shown in Figure 13. The diagnostic approach for sick or healthy dogs living in a non-endemic area that have travelled to an endemic area, should include quantitative serology three months after the beginning of exposure in the endemic area. 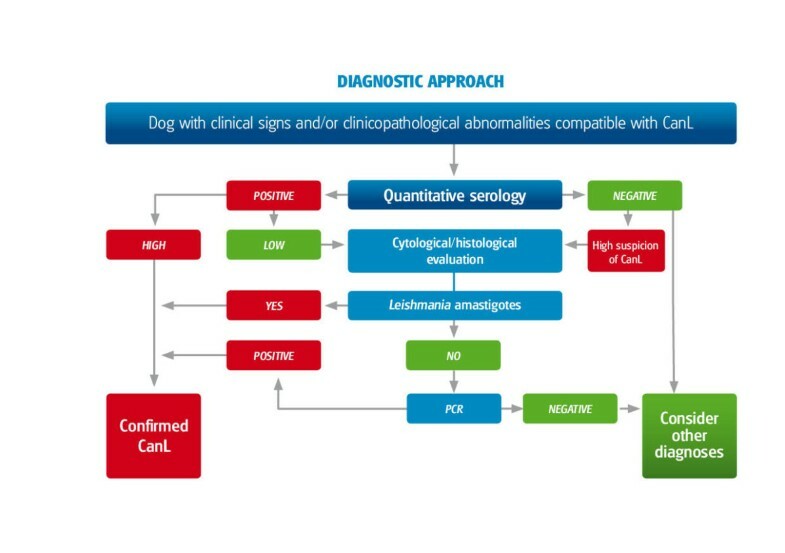 Flow chart for the diagnostic approach to dogs with suspected clinical signs and/or clinicopathological abnormalities consistent with CanL. A system of four clinical stages based on clinical signs, clinicopathological abnormalities and serological status was proposed by the LeishVet group in an effort to cover the wide spectrum of clinical manifestations and degrees of severity found in CanL . Different treatment protocols and prognoses are suggested for each clinical stage as described in Table 4. Dogs, which apart from the signs listed in stages I and II, may present signs originating from immune-complex lesions: vasculitis, arthritis, uveitis and glomerulonephritis. *Dogs with negative to medium positive antibody levels should be confirmed as infected by other diagnostic techniques such as cytology, histology, immunohistochemistry or PCR. High levels of antibodies, defined as a 3-4 fold elevation above the cut off level of a well established reference laboratory, are conclusive of a diagnosis of CanL. **Dogs in stage I (mild disease) are likely to require less prolonged treatment with one or two combined drugs or alternatively monitoring with no treatment. However, there is limited information on dogs in this stage and, therefore, treatment options remain to be defined. The most common drugs used for treatment of CanL, including dosage, combinations and side effects, are listed in Table 5. Several other candidate medications against CanL have been studied in vitro or in laboratory animals but rarely in controlled clinical trials and they are, therefore, currently not recommended for the routine treatment of CanL . 2 mg/kg/once a day for 28 days P.O. 10 mg/kg twice a day for at least 6-12 months P.O. *Registered for veterinary use in most European countries; both drugs are commonly recommended in combination with allopurinol. **Treatment prolongation by 2-3 weeks may be considered if patient improvement is insufficient. The clinical response to treatment of sick dogs can vary from poor to good depending on their overall initial clinicopathological status and their specific response to therapy. Dogs with renal insufficiency are expected to have a lower recovery rate in comparison to those without kidney compromise or only mild proteinuria. Therapy with antileishmanial drugs often leads to clinical cure  although treated dogs may continue to harbour the parasite and be infectious to sand flies, but to a lesser extent than pre-treatment [52, 55–57]. The vast majority of dogs experience clinical improvement within the first month of therapy [51, 52, 58]; however, a longer period of therapy may be required for others before improvement is apparent. The frequencies of monitoring and clinicopathological parameters, including serology, to be followed up during treatment of CanL are summarized in Table 6. Treatment of canine leishmaniosis - recommended monitoring of clinicopathological parameters and serology including frequency of follow up . Complete CBC, biochemical profile, serum electrophoresis (optional) and complete urinalysis including UPC in proteinuric dogs. After the first month of treatment and then every 3-4 months during the first year. Later on, if the dog is fully recovered clinically with treatment, a recheck would be recommended every 6 months or once a year. Not before 6 months after initial treatment and every 6 months or once a year thereafter. Can optionally be carried out at the same time as serology. The full usefulness of this assay for follow up during treatment is currently undetermined. *Some dogs present a significant decrease in antibody levels (more than a two-fold dilutions difference between the first and the following samples) associated with clinical improvement within 6 months to 1 year of treatment. Other dogs might not have a decrease in antibody levels despite clinical improvement. In contrast, a marked increase of antibody levels (more than two-fold elevation between monitoring samples) should be interpreted as a marker of relapse, especially in dogs following the discontinuation of treatment . The presence of complete physical and clinicopathological recovery evaluated by a thorough physical examination, CBC, full biochemistry panel and urinalysis. A marked decrease of antibody levels (to negative or borderline by a quantitative serological assay). In addition, allopurinol might be discontinued if it is not possible to control or decrease the xanthinuria with low purine diets or by reducing the drug's dosage, to avoid the risk of urolithiasis, if massive xanthine crystalluria is present . The management of clinically healthy infected dogs in areas where CanL is endemic is of great importance for practitioners. The presence of Leishmania DNA in the blood or other tissues of clinically healthy dogs living in endemic areas indicates that these dogs harbour infection , but they may never develop clinical disease . In contrast, a high positive antibody titer may indicate that an infected dog is heading towards the development of a widespread infection and future development of clinical disease . Therefore, we recommend using serology alone or the combination of serology with PCR for screening healthy dogs. It is recommended to avoid screening clinically healthy dogs only by PCR. Management of Leishmania- seropositive but clinically healthy dogs and PCR-positive but seronegative dogs. Clinically healthy but seropositive dogs would normally present with low antibody titers and should be confirmed by retesting. 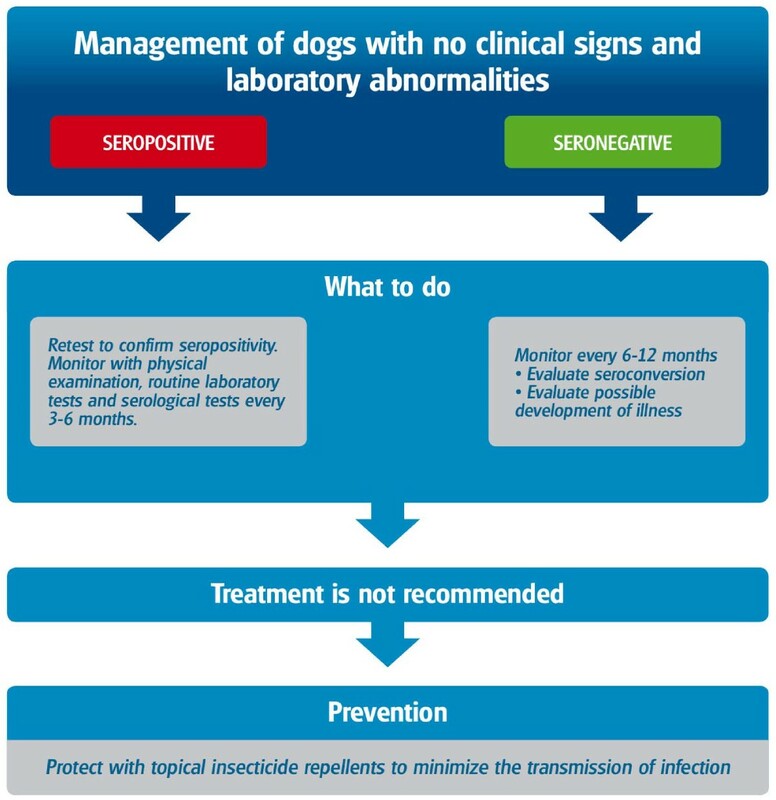 Confirmed seropositive dogs should be monitored with physical examinations, routine laboratory tests and serological tests on a regular basis every 3-6 months to assess the progression of infection towards disease. Their owners wish to have them monitored at least every 12 months for early detection of infection and the potential to develop disease. PCR should be used for the second above indication and as an ancillary test for the first and third above indications. The management of a clinically healthy seropositive dog and a clinically healthy seronegative and PCR-positive dog is summarized in Figure 14. Current preventative measures are mainly based on the use of veterinary registered products containing synthetic pyrethroids, permethrin, or deltamethrin with a repellent effect against sand flies whose efficacy has been demonstrated both experimentally [61–63] and in field studies [64–68]. These products are available in spot on formulation or in a collar form and they reduce the risk of new infections and the biting of sand flies on already infected dogs [64–68]. Other measures useful in the prevention of sand fly bites include [69, 70]: 1) keeping the dog indoors during the sand fly season from dusk to dawn; 2) reducing microhabitats favourable to sand flies such as piles of wood and stones in the vicinity of the house and in other locations where dogs spend time; 3) usage of indoor insecticide treatment . Deltamethrin collars: Control of feeding by phlebotomine sand flies (P. perniciosus) for a period of 5-6 months . Replace collar every 5-6 months. It should be applied at least 1-2 weeks before travelling. Veterinarians and dog owners are advised to carefully check the product's label recommendations and follow the manufacturer's instructions for the correct application and frequency of reapplication. Client education on the maintenance of an appropriate insecticide  throughout the period of sand fly activity in the Mediterranean basin (April-November) is also crucial for the protection of dogs . Purified Leishmania fraction vaccines appear currently to be the most effective and promising vaccines for dogs. These include the ''fucose mannose ligand'' (FML)-based vaccine [72, 73] and an excreted/secreted antigen purified from specific-medium culture supernatant of L. infantum based vaccine . The FML-based vaccine is currently available commercially in Brazil. The same vaccine has also been proposed as a transmission-blocking vaccine . Recently, another vaccine which contains the recombinant A2 protein and saponin as adjuvant has also been approved in Brazil . In Europe, a different vaccine based on cultured L. infantum purified excreted/secreted antigens has been approved for vaccination of dogs . The future for CanL control should be an integrated approach to prevention including vaccination against L. infantum with an effective canine vaccine and the use of long-acting topical insecticide applications. A vaccine would prevent the establishment of infection introduced by the bites of those sand flies that escape the insecticide effect . In Southern Europe, human visceral leishmaniosis caused by L. infantum is a zoonotic disease that affects young children or adults suffering from the Acquired Immune Deficiency Syndrome (AIDS) or immunosuppressive conditions [77, 78]. Dogs are considered the most important peridomestic reservoir of L. infantum infection for humans. However, the ownership of an infected dog does not appear to greatly increase the risk of disease in the family when transmission is already present in the region . The complexity of CanL and the wide range of its clinical manifestations, from inapparent infection to severe disease, make the management of CanL challenging. Diagnosis is performed based on clinicopathological manifestations and by confirmation of infection using mainly serological and molecular techniques. A staging system that divides the disease into four stages is aimed at assisting the clinician in determining the appropriate therapy, forecasting prognosis, and implementing follow-up steps required for the management of the leishmaniosis patient. Prevention should be an integrated approach including vaccination against L. infantum with an effective canine vaccine and the application of a topical insecticide. LSG, GM, AK, LC, MGP, LF, PB, GO and GB participated in the formation of the manuscript's content. LSG coordinated the preparation and writing of the manuscript. All authors contributed to helpful discussions, read and approved the final manuscript.